A few days ago I saw a reference to the website surfthechannel.com. This website shows entire episodes of various TV programs. I was afraid to hope there might actually be some British programs featured, but to my astonishment, there are a few. The best find so far has been the first episode of Eastenders, originally broadcast on Feb. 18, 1985. 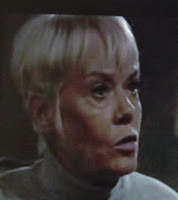 How funny to see how some of the characters changed over the years, particularly Pauline Fowler. As a fan of the show, I was amazed to see how young and happy Pauline originally was. She even managed a smile in the original episode . . . my, how times changed. The passage of a little over 20 years certainly did alter her appearance. Anoth er change that was apparent was poor old Ian Beale. Of course, he was just a child when he started on the show, so he would be expected to go through some changes as he grew up. Still, he does seem to have rather a bad case of the "curse of the Eastenders eye bags". On the book front, I've been reading Silent in the Grave by Deanna Raybourne. It is a Victorian mystery set in London (is there any other kind?). It's early days yet, but it seems enjoyable so far. I've nearly finished with the next to the last audio book in the No. 1 Ladies' Detective Agency series, The Good Husband of Zebra Drive. An upsetting event has occurred, but I'm sure it will be worked out before the end of the story. I can't see an event like this not being set right before the next book begins. Still, a bit of conflict is a good thing, as one or two of the books in the series were rather sparse on action (although still charming and enjoyable). It will seem strange when I've worked through all of the books in the series to start another audio book. Mma Ramotswe and co. have kept me entertained for so long that I won't know what to do without them!